First off, thanks for putting up with the lack of content in recent months everyone! Things have been a bit crazy with my wife and I purchasing our first house, curling and keeping up with my City Newspaper reviews. I’ll be back more in January for sure but in the meantime I’ll be posting my recent published reviews starting with the piece I wrote on Raj Mahal in Henrietta. This was an interesting chance to review an ethnic cuisine I’m familiar with but don’t have a ton of experience on a critical side of things. I brought along a friend to eat with my wife and I during one of the meals to get her opinion since she has had a lot more experience with this style of food both in the US and abroad. I have something to confess: I hate the pumpkin spice over-saturation that is going on nowadays. These warm spices are found not only in seasonal pies and lattes but are popping up absolutely everywhere — it is just plain overwhelming. Thankfully if I want to embrace these fall flavors without ruining my palate, Indian cuisine is a safe haven where spices like cinnamon, cloves, and nutmeg can be a part of a balanced mix that enhances the food. Ruby Sud has served home-style Indian recipes to the people of Rochester for almost 30 years, starting at the India House and eventually transitioning to her own restaurant, Raj Mahal. In the time between closing the original Raj Mahal location on Monroe Avenue and opening the current Henrietta location in May 2013, Ruby contributed to Wegmans’ Indian cuisine offerings on their prepared foods program. Raj Mahal’s menu offers a tour of India with familiar dishes from the country’s northern region, less common dishes from the southern region, and Indian-Chinese fusion. 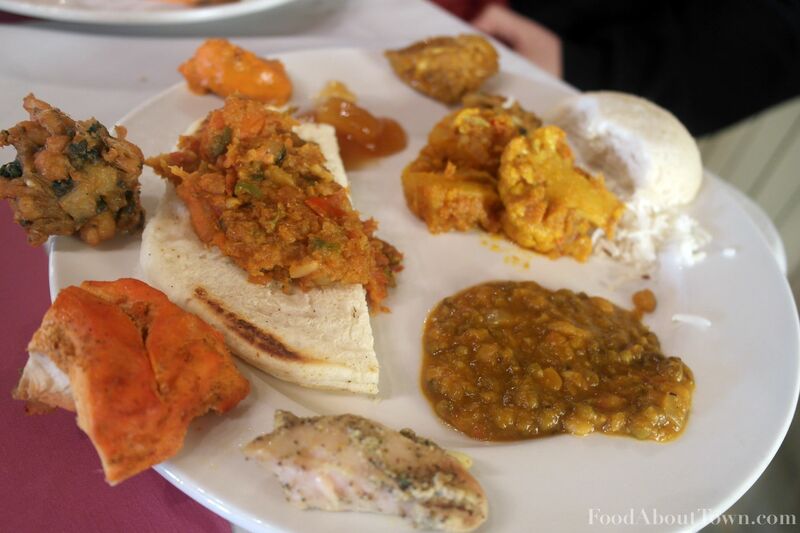 My first dinner at Raj Mahal went through some of the menu’s diverse selections, and then for the second visit wife and I dove head first into the buffet to try some of the more popular dishes and see what stood out. We made two ventures into the southern portion of menu with the Medu Vada ($4.95) as an appetizer and the Paper Masala Dosa ($9.95) as part of our medley of entrees. The Dosa dramatically came out twice as long as the platter it was served on and consisted of a thin, crispy, and lightly-chewy lentil and rice crepe wrapped around mildly seasoned potato and onion filling. 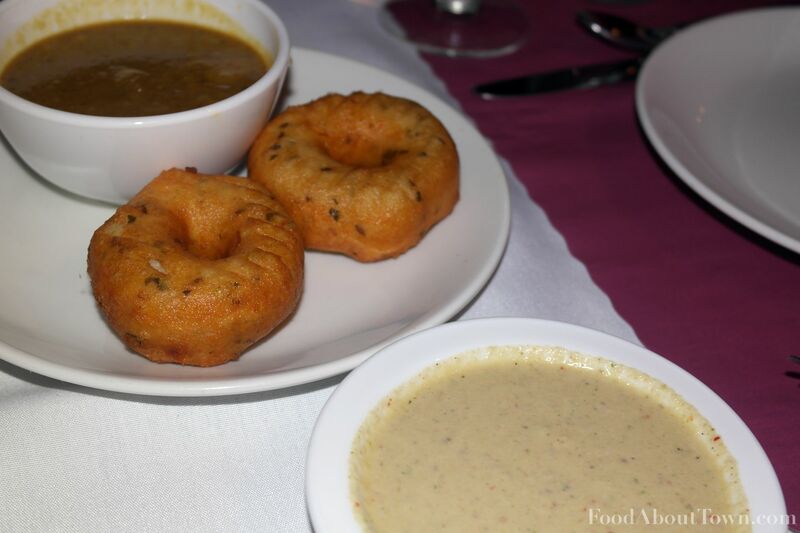 I preferred it to the bland and spongy doughnut shaped Medu Vada lentil dumplings. I’ve learned that those previously mentioned warm spices, along with coconuts, are major crops in southern India and those flavors were evident in the complex sambhar and coconut chutneys that accompanied the two southern dishes. Gobi Manchurian ($8.95) was our choice of the Indian-Chinese dishes and is an interesting fusion cuisine I was glad to have tried. Reduced soy sauce was the most dominant flavor but the garlic, chili, ginger, and scallions weren’t completely obfuscated by soy potency. Cauliflower florets were just tender enough to be cooked through and a good foil to the strong, salty seasoning that reminded me of an amped up brown sauce you’d see at a Chinese takeout spot. 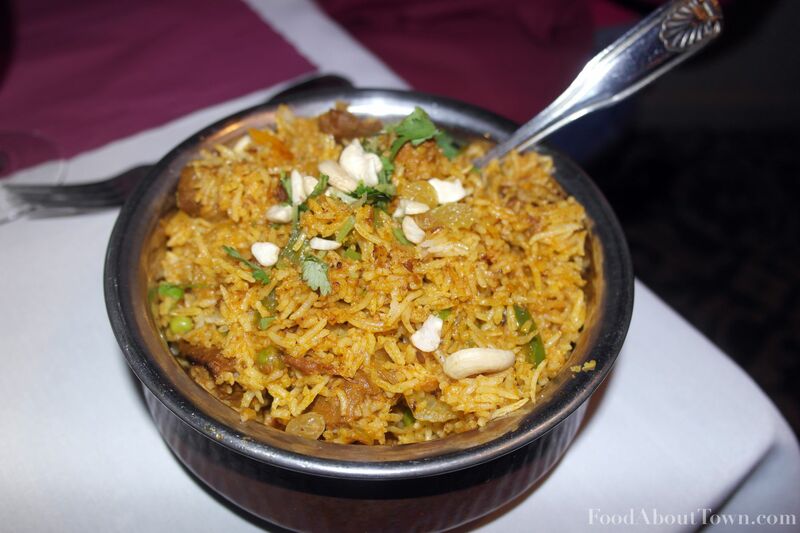 Lamb Biryani ($15.95) is one of my typical takeout Indian dishes and I was happy to find a version here that might take over as my new go-to. Lamb pieces were cooked just under well-done, which was a nice change of pace, and the rice had a good depth of earthy, spiced flavor with a medium heat level. The dish would have benefitted from more than a garnish portion of cashews and raisins, but when mixed with a touch of raita and scooped up onto garlic naan, this is perfect comfort food for me. An order of Hariyali Kebab ($14.95) didn’t deliver the green chili heat that was mentioned on the menu, but did offer a bright flavor profile with herbs, ginger, garlic, plenty of salt, and an available lemon squeeze that all worked to counter the light char on the chunks of chicken breast. The yogurt marinade did wonders to keep the chicken moist and tender and they were some of the best bites of the evening. A lot of people’s main view of Indian food is through the sneeze guards at buffets. Although buffets have inherent issues, the spread at Raj Mahal offers a chance to experience a variety of dishes at a reasonable price. To me, the standouts were dishes served with plenty of sauce that weren’t as sensitive to time spent sitting in a steam table. Both the chicken thighs in the curry and the chickpeas in the Chana Masala were cooked to a pleasant consistency with sauces that were richer and a touch more dark and rustic than most versions I’ve had. The Paneer Bhurji (shredded farmers cheese) made for a mild and creamy dish accented by peppers and tomatoes. Other highlights were the Palak Tofu (cooked down spinach), Gobi Aloo (spiced cauliflower) and the salty, fermented flavor of the hot pickle. Unsurprisingly, buffet items that were fried or made of flour didn’t have that just-finished-cooking freshness that is necessary to get those important contrasts in texture. Dishes like iddly (steamed rice and lentil cakes), vegetable fritters, and Uthappam (a southern lentil pancake) suffered the most from this effect. Popular dishes like Chicken Makhani and Tandoori Chicken both ended up a touch more dry than I would have preferred, but both flavor profiles seemed on point. 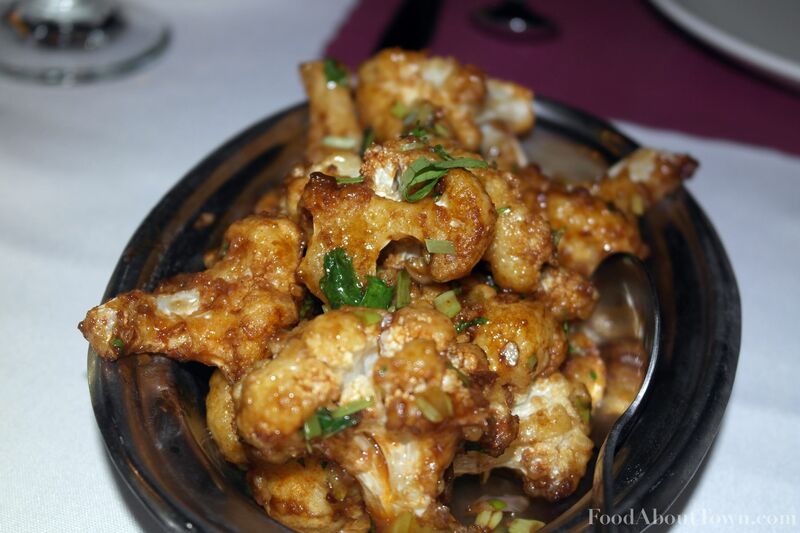 Walking away from my visits to Raj Mahal, I felt truly satisfied with the Indian flavors I experienced. The use of family recipes for the dishes came across in the diverse seasoning and the inclusion of some of the lesser known parts of Indian cuisine was an eye opener. I’m looking forward to diving further into the menu here to see what Ruby and her team have in store. If you get inspired by the food, you should definitely visit the family’s grocery store next to the restaurant, Spice Bazaar. Plenty of fresh produce and spice mixes to let you try and re-create this comfort food at home.